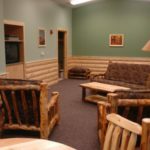 If you are looking for a quiet place to enjoy some rest and relaxation the Trails West YMCA Camp has just what you are needing. Check out our lodging options! There are 4 cabin pods attached off the back of the Fliesbach Retreat Center. Each cabin pod has 2 rooms for a grand total of 8 sleeping rooms that together can accommodate up to 48 people. Each cabin contains a queen-sized bed and two bunk beds, shower and bathroom. The two cabins in each pod share a commons area that has a couch, chairs, table/chairs and small refrigerator. DVD/Satellite TV, Wireless Internet. Handicap accessible. *Rent all 8 Rooms and receive use of the Fliesbach Retreat Center for FREE! Check out time for meeting room is at 10 AM on last day of rental same as cabins. Fee can be added to extend your stay if availability. 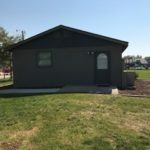 Our Massey Family Cabin provides a chance for you to have some quiet time with your family in your little home away from home at our beautiful camp. The cabin bedroom includes two queen-sized beds and sleeps 4 (additional guests fee will apply). Small living room, small kitchen and bathroom/shower. 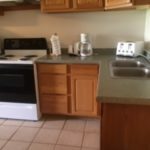 Amenities: DVD/Satellite TV, Wireless Internet. 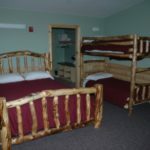 The bunk cabins offer traditional “camp style” lodging at a bargain price. 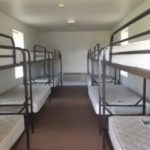 Each unit is basic, housing only six bunk beds which can sleep a total of 12 people. 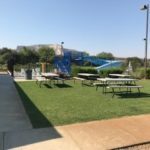 Restrooms and shower facilities are located under the Activity Center and available only for those using the bunk cabins. All units have heating and air conditioning. *****Linens and towels are NOT provided. Amenities available FREE for guests to utilize while staying with us! Please call Candie for pricing and reservation information @ (308)641-9587 or at the Scottsbluff Family YMCA (308)635-2318. You can also email her at calbright@ymcaofscottsbluff.org.